Many people do not realize how easy it is to put together a computer system from parts. In fact, many systems that users build can outperform purchased desktop computers. The biggest challenge of putting together a computer system is typically finding what parts to buy. That is where this guide comes in. This is really a guideline for those looking to put together their own computer system but don't want to break the bank. For around $500, it is possible to to put together a highly functional computer system that works extremely well for general purpose computing such as internet access, office applications and even digital photography. Below is a list of parts that I have selected that can be used to put together such a system. It includes all of the parts that are internal to the computer plus the operating system. It will be necessary to buy a monitor and other peripherals such as speakers to complete it. Many of the parts on this list are sold as OEM products. They are the same items that would come in a retail package but have less material as they are sold in bulk typically to builders. They should carry the same warranties and protections as retail box products. Remember that this is just a guide of recommended products. There are many alternative components available that will perform just as well. In addition to the name of the item, a link is included for shopping for the components. 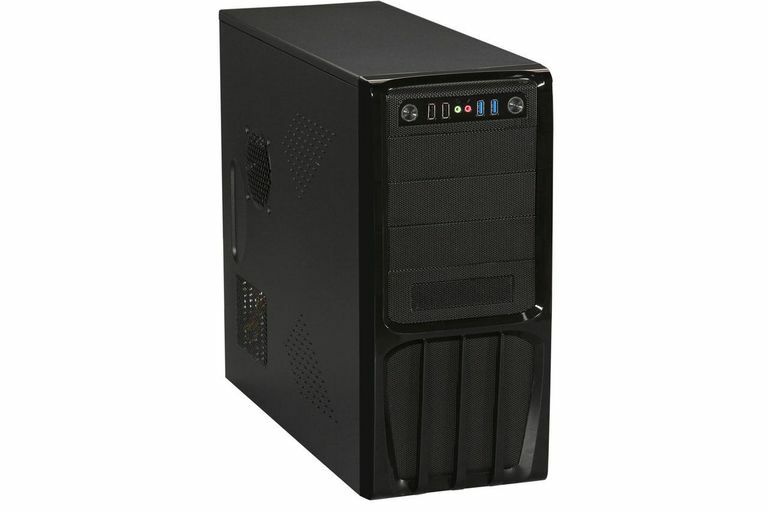 A well designed low cost steel desktop mid-tower case that also includes a 500W power supply. The case has many great features that make it very easy to work with. In order to support the most recent Intel processors it is necessary to get an LGA 1151 board. This board from Gigabyte uses the budget oriented B150 chipset but supports great features such as DDR4 and M.2 for future performance upgrades. While this dual core processor uses the Pentium name, it uses the same SkyLake core as the latest Intel Core i 6000 series processors. It offers a good level of performance plus support for many new technologies. Seagate is one of the oldest names in the hard drive market but that also means that have lots of experience. This drive offers a nice balance of size and performance at a very good price. This low cost DVD burner supports all of the current DVD media standards and has 24x speeds for DVD+/-R media. It is no longer required though as Microsoft offers Windows installers on USB drives. Windows latest operating system fixes many of the errors of Windows 8 and now is avaiable on a USB flash drive for easy installing without an optical drive most people don't need now. This list of components will make up the heart of the computer system but it still needs a monitor. There are a wide range of monitor sizes but the most afford to tend to be the smaller ones. I would recommend looking at my Best 24-inch LCD Monitors list for a good low-cost display. There are also no speakers or headphones for the audio but some monitors can have this built in such that they are not needed. Once you have all the parts, the computer system will have to be assembled and installed. Tutorials on the various steps required to install the parts together into the computer system can be found in one of two ways. Lifewire.com offers a number of individual Tutorials for the various steps. For those with access to a Kindle e-reader or application, you can also pick up a copy of Build Your Own Desktop PC which offers detailed images and descriptions.